Let start the topic with a simple but most important question. What is the last place in your mind, when you decide to relocate? Well, there may be lots of things popping up in your mind but if you are still encountering some difficulty to get the answer, then it is the bathroom of your house. You may be quite astonished to know this, but yes, it is a fact that most of the people use the bathroom till the last moving day. This has been noticed by the Top Packers and Movers Gurgaon. 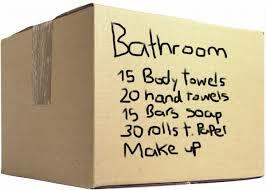 Packing daily used products in a separate box: It is vital to segregate the daily used bathroom products such as the shampoo, cosmetics, soap, towels, etc and pack them in a separate moving box. The box in which are items are to be shifted must be strong so that the goods do not get spilled out and get damaged. Put the unused items in a trash bin: It does not make quite a sense to pack the unused shampoo bottles, toilet cleaners, bar soaps, etc. These unused items must be put in a trash bin. If, however, you decide to pack these products, then not only you will be making the moving boxes heavier but also increasing the Best Packers and Movers Gurgaon cost. So, if you want to save some money and make your movement of goods to new place stress-free, then getting rid of the unused bathroom products is a key here. Use sealable bags to pack liquid items: It is a very important task that needs to be done in a correct manner. The liquid items must be packed in the sealable bags so that they do not spread out. The packers and movers companies are of the view that due to improper planning, if the liquid products are not stored in these kinds of bags and placed with the other valuable household stuffs, then there is a higher percentage of chance, that the liquid may leak out and damage the items. Consider quality packing materials for fragile goods: If there are some fragile goods in your bathroom, then consider packing them using the quality packing materials such as the bubble wraps, packing peanuts, robust cardboard box and so on. If you need a professional assistance to pack the items in the new location for the immediate shifting process, then you can take some tips from Trusted Movers in Gurgaon and make your relocation really unforgettable. The most recommended packers and movers from LogisticMart company can be hired for the smooth and fast relocation. It counts with the most efficient and experienced packing and moving firms. Avoid throwing hazardous materials openly: The packers and movers firms strictly advise that you should not throw away the empty or half empty bottles of the hazardous materials such as the chemicals, adhesives, paint, etc openly. These products are very harmful for the environment, which can impact your health. You must take the help of your relocation service provider or any other renowned protection agency for disposing off the unsafe items in a right manner. So, use these prominent bathroom packing tips offered by Trusted Movers in Gurgaon companies to move your items swiftly and good luck for your relocation.